DS-61-3 is a 1996 update to a similarly-titled collection that could have been released in 1995, judging by the timestamp on FROMDREM. 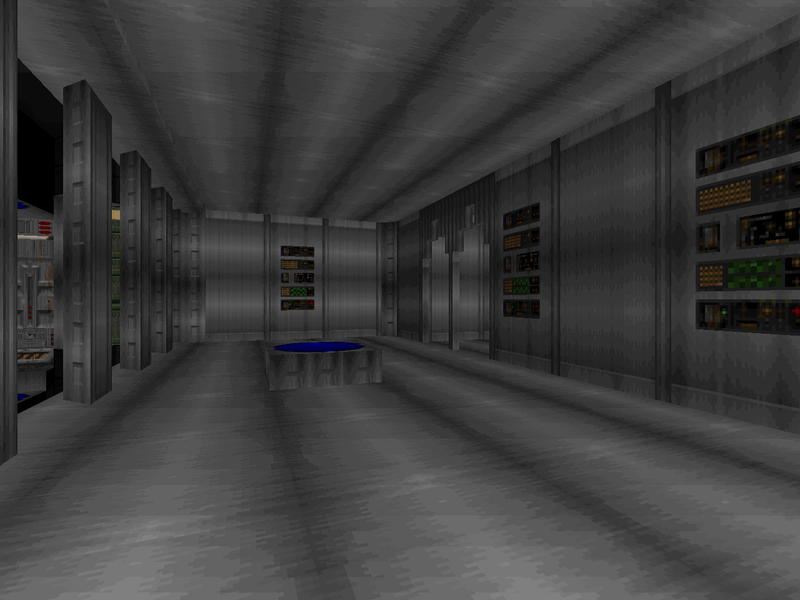 It contained six individual PWADs, all of which occupy the MAP01 slot. The imaginatively-titled LAB is one such delight. Of all the files in the package it's the only one with a framing story. Malcolm manages to slam both schools of thought concerning Doom's antagonists into one blurb. He describing the facility in question as belonging to aliens and then goes on to assert that while you ought to "blow it to hell", it's actually "already there". 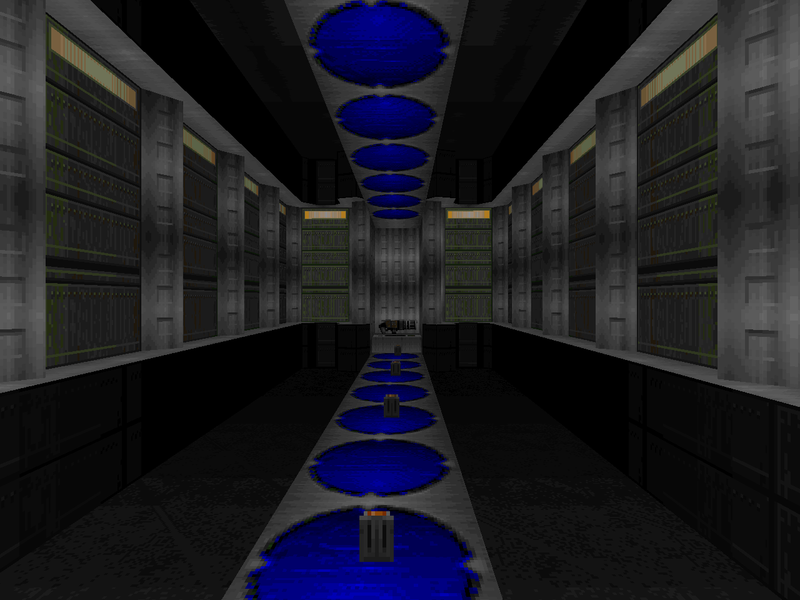 Like its fellow files, Lab is a short level compared to the average. It's divided into three distinct sections that are geographically isolated and only accessible via a small network of teleporters. The first is some kind of entryway built onto the side of an unfinished earthen shaft. You'll eventually return here. The start feels underwhelming because it's just you pistol whipping a handful of zombimen but after you grab the chaingun it gets a little interesting in the cave. It's cramped but prompts some relatively quick decision-making. I also like that the only way to progress is an obvious marked non-secret but it's not as though haters will have a lot of options to try. The second room is definitely the most dangerous. It looks pretty cool as a concrete and space silver installation. The side where you start is lit bright and has a sterile appearance, just like a lab ought to be. 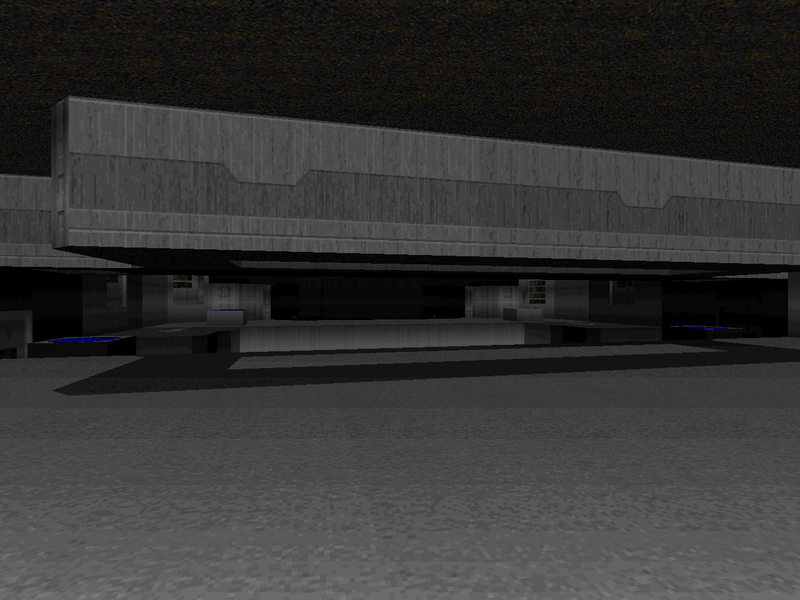 The opposite side is more darkly lit and has several different dynamic lights going, giving it a sinister atmosphere. The portions are divided by a deep, lava-filled trench. The "clean" side has a row of pulsing lights right before the fissure as if to say "Danger!" This scene did a pretty good job of selling me on the idea that the lab already had one foot in the inferno. It's also the scene of two big fights. Sailor tries to help you out by throwing a blur sphere your way and that's a boon against the chaingunners but the imps are as a result more unpredictable. 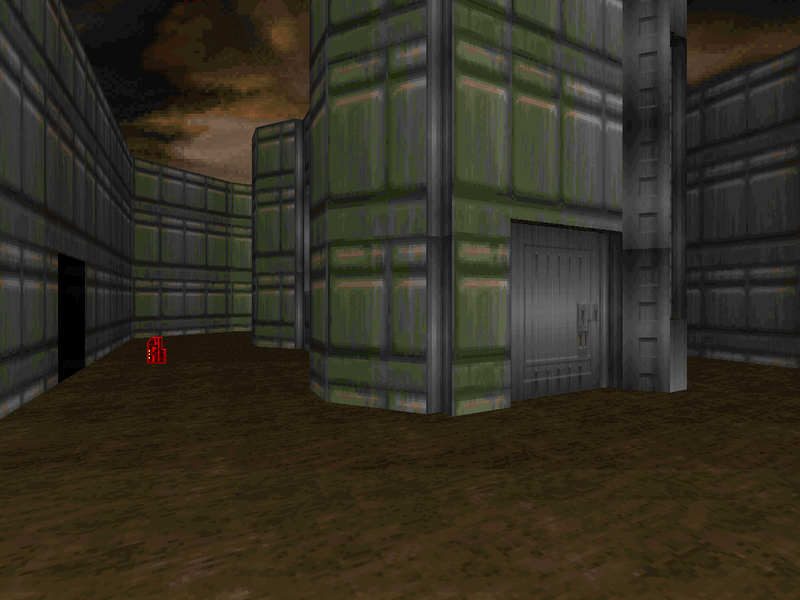 The teleporters are easy to spot in ZDoom because of color-coding but vanilla Doom players may be caught off-guard by attempting to vault across the chaingunner pillars and winding up in a much closer encounter. The return fight is loaded with meat but you ought to have the secret plasma gun in hand which makes it a relatively simple hose-style encounter considering that it's pretty easy to dodge fireballs coming at you from the opposite end of the room. 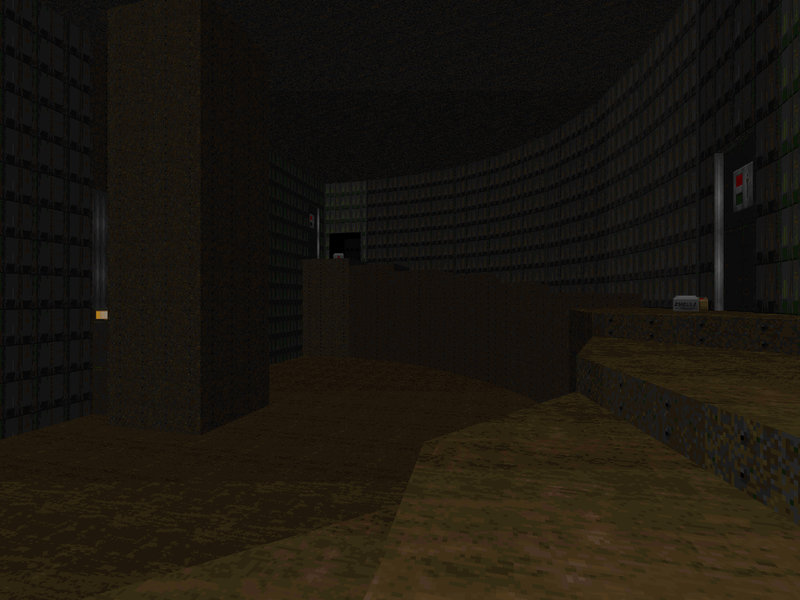 The third area comes between the two encounters and it's a rather banal-looking half-spiral staircase. It's also the location of a hidden annex containing the slot 6 weapon and a bunch of cell ammo, so you'll definitely want to hunt for it. Particularly since you have to either grab the red key or step inside the gun alcove (both being within spitting distance) in order to open the exit. I really liked LAB. It's a short, fun level with some punchy action and a slightly tricky progression path. The last part is probably what I liked the most. If you want a short, tech-heavy level and don't mind having to track down a couple of progression points, then you could do a lot worse.